WEST LAFAYETTE, Ind. — Purdue University’s Latino Cultural Center will celebrate the Mexican holiday, “Día de los Muertos,” or Day of the Dead, with music, crafts and food from 4-7 p.m. Oct. 30 at the YWCA of Greater Lafayette at 605 N. Sixth Street in Downtown Lafayette. The event is free and open to the public. 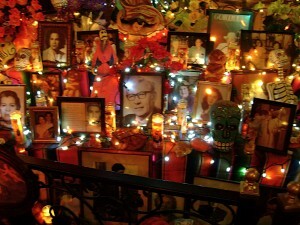 On Día de los Muertos, people remember and honor their deceased loved ones by preparing altars for them and decorating the altars with food and valued possessions of the departed. The holiday, which has its roots in the Aztec and indigenous cultures of Mexico, is celebrated in Mexico and in Latino communities across North America on Nov. 1 and Nov. 2, coinciding with the Roman Catholic holidays of All Saints’ Day and All Souls’ Day. At the event, approximately 15 altars will be on display, created by numerous groups including the Indiana Latino Institute, Latino Center of Tippecanoe County, Ivy Tech Spanish department, and other Purdue departments and student organizations, Alvarado said. There also will be a precolonial dance demonstration by a Mexican dance troupe. Free food and refreshments will be served.